I played both previous games and genuinely enjoyed them, but I just didn’t have the patience to finish them. It got to a point where the constant dying felt more like a brick wall than a legitimate challenge. However, I’ve stuck with the third game for about 20 hours now (more, had I had more chances to play). I feel it rewards your efforts more effectively. I’m getting better drops, for one thing, and the combat feels more balanced and fair. I feel that’s what the previous Souls games were missing; they seemed difficult just for the sake of being difficult, whereas this one feels legitimately challenging. There are some segments of that game are just straight-up unfair. I don’t care how much you “git gud,” when you’re fighting a boss with an attack that covers 90% of the area in which you have to fight them, you’re probably going to get hit. When you can only block a single hit from an enemy, even with full stamina, they are going to nail you with the rest of their eight-hit insta-kill combo of deadly death. Yes, dying repeatedly means you get numerous chances to study the tough enemies and identify their patterns and weaknesses, but the same gripe I have with competitive FPS games eventually rears its ugly head: sometimes, you die so quickly and decisively, you don’t have a chance to learn a damn thing. You get caught in a cycle die/respawn until you get lucky. That’s not fun or challenging—that’s just frustrating, and that boss becomes a chore. You don’t feel joy or victory or even relief when you finally beat it; you just feel exhausted and ready to move on. With that being said, there are three reasons that I don’t support an easy mode for this game, or any number of games that are designed to prefer challenge over narrative. 1. I want the developers to strive for better design over simply making the enemies weaker and the player stronger. It seems like answering players’ request for a more approachable game by simply making it more of a cakewalk is a just a wee bit lazy. “Oh, you can’t get past this boss? Okay, instead of studying his attacks and weaknesses and looking for balancing issues with the encounter before patching in some fixes, we’ll just give you an easy mode so you can kill him in less hits.” Nope, not working for me. I know game development is a grueling, almost thankless, job. That doesn’t mean that I want the developers to take shortcuts. I want them to do their job effectively; part of that entails delivering a balanced and approachable game. 2. 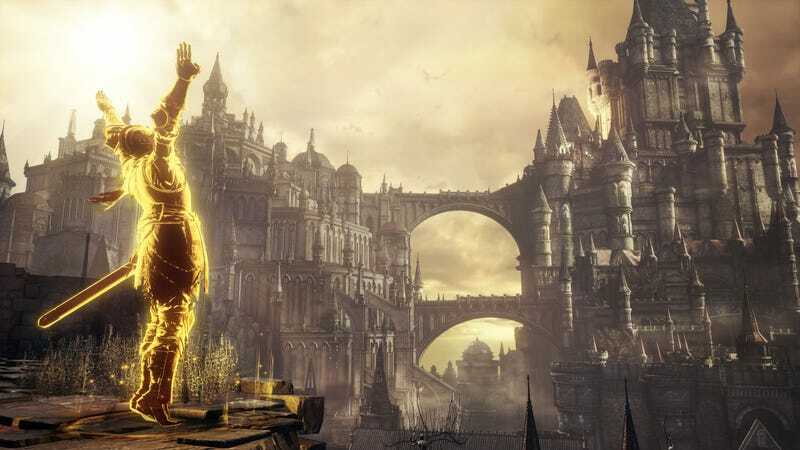 The crushing difficulty of Dark Souls III really IS part of the game’s thematics. The idea is that you are a lone warrior fighting against near impossible odds. You’re supposed to be weak. It gives value to your achievements and your character’s progression. Granted, for a less-skilled player (that’s not meant an insult—I’m certainly closer to the low end of overall skill than the high end) an easy mode would still offer that experience, but again: I want that experience to come from a better designed game, not from just tweaking a few values in the game’s code. After all, if you make an easy mode that has the player-character overpowered, your hard mode is going to be less challenging; conversely, if your easy mode presents a challenge to even marginally skilled gamers for the sake of thematics, your hard mode would have to be nigh impossible to present a challenge to more experienced and skilled players. 3. This may sound gamerbro-ish, but some games are just meant to be hard. Some books are more daunting than others; they trade crisp, light prose and a brisk pace for deep introspection and reflection. They examine characters and settings with more depth. They don’t make for fun reading, but you’re certainly (hopefully) a more enlightened person after having read them. Some games are the same way. They don’t want to empower the player and offer them an exciting diversion; they want to make you think and react with more than just a cursory awareness. You may not always enjoy the experience, but once you get to the end, you look back on it and really feel like you’ve accomplished something. The Dark Souls series represent these types of games. Yes, they have a rich mythology, but—thanks to social media and some dedicated fans—one could still immerse themselves in that mythology. Playing the game shouldn’t be a story-first experience. Yes, there are certain design flaws with some of the game’s encounters, but those flaws would still be present if there was an easy mode. Instead of demanding easier games, let’s demand better ones.